Atopic dermatitis is an inflammatory chronic skin disease sometimes referred to as "skin asthma". 10-20% of children suffer from the disease during their childhood, and as they grow up, the disease tends to disappear. The disease is characterized by itching and reddish dry skin appearing in various places on the body (neck, elbow and knee joints, ankles, hands, and palms). 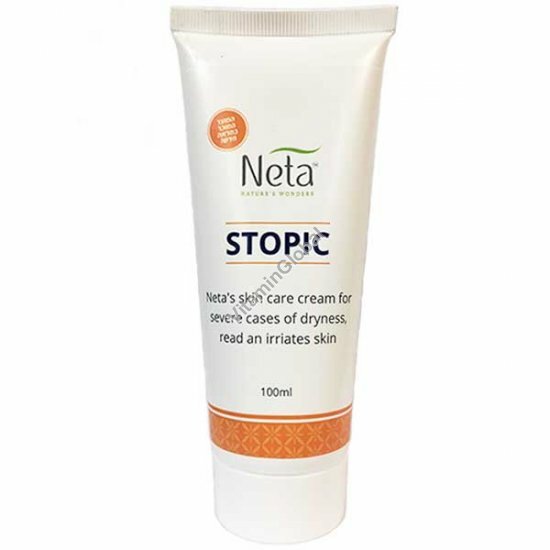 Neta Stopic skin care cream is intended for severe cases of dryness, redness, and is especially effective with cases of "skin asthma" (atopic dermatitis) and other skin irritations. Stopic was developed with a special emphasis on skin sensitivities and the prevention of skin reactions, and is particularly appropriate for children because of their especially sensitive skin. Stopic skin cream is based on plants and high-quality oils. The active ingredients in Stopic have research-proven medicinal properties, recognized in professional literature for their efficicacy. Active Ingredients: Calendula flowers extract, Carrot root, Grape seed oil, Nigella oil, Avocado oil. Marigold extract - contains components with antioxidant and anti-inflammatory properties. Marigold is helpful in cases of skin inflammations, severe wounds, moderate skin blisters, and problematic skin. Grape seed oil - protects skin from UV rays, assists in preventing skin ageing, stabilizes skin collagen and elastin, thus preserving the skin's elasticity. Prevents destruction of hyaluronic acid for the preservation of connective tissue. Grape seed oil is rich in fatty acids, which strengthen skin cells, while nourishing and preserving the skin's moisture. Nigella oil - for injured, cracked, damaged, or dry skin. A strong antioxidant that protects skin from infections. Research shows that nigella stimulates new skin grown and rejuvenates existing skin, providing it with natural moisture. Avocado oil - rich in vitamins and fatty acids, which favorably affect the skin. Its medical value is related to the high concentration of non-saponifying acids, which contribute to the treatment of non-healing wounds. Carrot extract - is known as an anti-inflammatory agent, and a source of skin-essential vitamin A. Wheat germ oil - rich in vitamin E, which prevents oxidation and protects skin against free radicals. Recommended diet: It is recommended to refrain from eating foodstuffs containing food colorings, preservatives, monosodium glutamate, salt, white flour. It is also recommended to increase one's intake of fresh vegetables. Please note: A slight burning sensation is possible for a few minutes during the first days of application - the skin's natural reaction to the product. If the burning sensation worsens, rinse the area with lukewarm water. Other Ingredients: Sweet almond oil, glyceryl stearate citrate & stearyl alcohol & glyceryl caprylate, glycerin, castor seed oil & hydrogenated castor oil & carnauba wax, nigella sativa seed oil, cetyl alcohol, caprilic / capric triglyceride, cetearyl alcohol, shea butter, phenoxyethanol & ethylhexylglycerin, sea buckthorn oil, xanthan gum, potassium sorbate, sodium benzoate, wheat germ oil. This information is not intended as formal medical advice, nor may the product serve as a substitute for doctor-supervised medical treatment. It is recommended to consult with a physician for any medical problem. This cream is amazing it's helped my little girl to heal so called eczema in her face. It's appeared when she was 11mnt old and doctors keep telling to us that it is eczema. Only showed on her face .we tryed steroid, antifungal, antibacterial creams and they didn't help .This cream was suggested by a stranger and it helped and healed her wounds .my baby have a clean skin now. Date Added: 09/07/2016, by Maryia J.